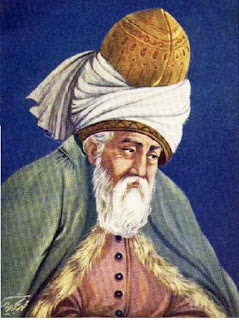 This is to me a rather jolting poem by Jelaluddin Rumi, the 13th century Muslim scholar, mystic, and poet. I am just getting acquainted with Rumi. Given my work with hospitality regarding homeless and other neighbors, I found “The Guest House” intriguing. Instead of fearing the stranger, the challenge is to welcome and learn what it is they are sent to offer. My favorite books on hospitality are "Reaching Out" by Henri Nouwen and "Making Room" by Christine Pohl. Nouwen says the movement from "hostility to hospitality" is one of three primary spiritual developments in our lives. His description of hospitality is worth contemplating, in distinction from faux hosptitality which is nontransformative. Pohl explores the historical and theological development and devolution or deformation of hosptiality. She cites recent renewal of hospitality in specific intentional communities (LeCambon being one). Very insightful and practicable. Both Nouwen and Pohl explore the mutuality of change or transformation in the practice of hospitality. When practiced genuinely, it is a two-way street. I have not yet read "Lest Innocent Blood Be Shed." Thanks for the recommendation.